Sugar Hill Police Department updated their cover photo. Sugar Hill Police Department updated their profile picture. The mission of the Sugar Hill Police Department is to work in partnership with the community to provide the best possible public safety services, with emphasis on sensitivity to community needs and concerns. “Partnership”, in this sense, means a shared responsibility for community safety among the police and fire divisions, other town departments and community residents who cooperate together in providing information and influence to assure continuing community safety. Sugar Hill Police Officers have aquired an understanding of the community’s policing problems and particular circumstances that affect public safety. The Sugar Hill Police Department is firmly committed to maintaining a spirit of partnership with the community. 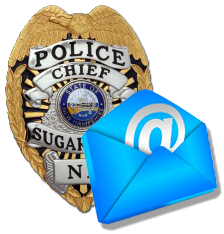 Click here to email the Chief with general questions or concerns.